(ST. LOUIS) – Webster University will dedicate Browning Hall, the new state-of-the-art interdisciplinary science building, with a keynote speech, a series of faculty and student presentations and a ceremony on Oct. 19. The event is free and open to the public. Highlights of the building include a human anatomy laboratory, a nurse anesthesia simulation lab, a teaching kitchen, a student open research lab and a 129-seat auditorium. The building was designed to be LEED silver. The dedication ceremony will feature comments from university administrators and Jinny Browning along with other members of the Browning Family, the largest donors to the Browning Hall project. The keynote speaker for the dedication event is Vladimir Ivkovic, a translational neuroscientist and integrative physiologist who has contributed to ground-breaking research on brain activity and brain injuries. Ivkovic earned a bachelor’s degree from Webster University’s Vienna campus in 1999. He earned a master’s degrees from the University of Zagreb and the International Space University in France in 2005 and 2006, respectively. He completed his Ph.D from the University of Houston. He is now in fourth year of postdoctoral research at Massachusetts General Hospital and Harvard Medical School, where he also serves as an instructor in the Department of Psychology and Neural Systems Group. Among his achievements are his contributions to developing a portable brain-scanning system for NASA that has been used during microgravity flights. He previously worked on research regarding brain injuries among players of the National Football League and also into traumatic brain injuries suffered by military personnel on the battlefield. Currently, Ivkovic is a member of research teams at Harvard and NASA that is investigating brain activity during spacecraft docking maneuvers and sleep physiology in simulated space missions lasting 30 to 45 days. Ivkovic also is collaborating with the Boston Fire Department in researching early detection and treatment of post-traumatic stress in firefighters and other first responders. 2:30 p.m. - “Liberal Arts & Sciences on Display” faculty panel. During this hour, Webster faculty members will offer 10-minute lectures regarding their topics of interest. Student Research Showcase & Reception Construction on Browning Hall began in spring of 2016 and was completed in August of 2017. Browning Hall houses the departments of Anthropology and Sociology, Biological Sciences, English as a Second Language, International Language and Cultures, Nurse Anesthesia, Nursing, Psychology, Women Gender & Sexuality Studies and the Institute of Human Rights. Last month, the building was recognized for its design excellence by the American Institute of Architects St. Louis Chapter. The building was designed by Cannon Design, with Paric Corporation as the general contractor. 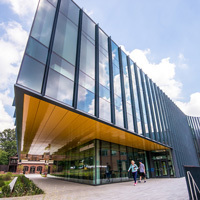 For more information on the architecture, visit https://www.cannondesign.com/our-work/work/webster-university-interdisciplinary-science-building/. For more information on the building, visit http://www.webster.edu/arts-and-sciences/browning-hall-dedication.html#event.